When you hear the word authority, it conjures up an image of supreme power. Few people actually like being under someone else’s authority. We would prefer others to be under our authority rather than have to fall under theirs. But the truth is, every person is under the authority of someone else. While we may not like or agree with that authority, sometimes we have no choice but to be submissive to that authority. authority, noun, pl. -ties.1. the power to enforce obedience; right to control, command, or make decisions; jurisdiction. Ex. A father has authority over his children. A policeman has the authority to arrest speeding drivers. 2. a person, body, board, or the like, that has such power, right, or jurisdiction. Ex. The authority came to the door and asked why I wasn't in school. 3. a source of correct information or wise advice; book or passage regarded as settling a disputed point. Ex. A good dictionary is an authority on the meanings of words. 4. an expert on some subject; person whose advice or opinion is accepted. Ex. He is an authority on the Revolutionary War. Recognizing all these pitfalls, many authorities ... insist economists should never make precise predictions (Newsweek). 5. power over the opinions of others; influence that commands respect and confidence. Ex. the authority of Aristotle. (SYN) prestige. 6. delegated power; authorization. Ex. An appointed official derives his authority from the President. 7. a judicial opinion that may be cited as a precedent. expr. the authorities, the officials in control; government of a country, state, or local area. Ex. Who are the proper authorities to give permits to hunt or fish? Authority, noun, pl. -ties.(U.S.) a government body that runs some activity or business on behalf of the public. Authorities provide electricity for housing, develop ports, build turnpikes, and perform other public business functions. New York Port Authority, Tennessee Valley Authority. As you can see from this definition, authority comes in many different forms. There are two types of authority that I would like to concentrate on here. The first one is the authority of the Word of God, otherwise known as the Bible. Item 3 of the World Book Millennium 2000’s definition for authority states, “...a source of correct information or wise advice...” This definition perfectly describes the Word of God which is the most reliable source of correct information about God, man’s condition, and salvation. The second type of authority that we should look at is the authority that God has delegated to man, especially in His Church. We will see that in the Church, contrary to what some Christians have been taught, no man has been given the power to enforce obedience. (item 1of the World Book Millennium 2000’s definition for authority). Some Christian leaders have claimed authority for themselves, to lead people who submit to them, to do things which they ought not do. The purpose for this essay is to reveal what the Bible really says about authority. We’ll look at who has authority to do certain things, what it means to submit to spiritual authorities, and how to avoid submitting to authorities who really have no authority at all. It is my opinion that the Bible is the Word of God, without error or contradiction, and it is complete in it's scope and purpose, to bring salvation to those who believe in Christ Jesus, and to teach us to live as Christians ought to live. To look at the Bible as anything but the Word of God is to deny the teachings of the early Church fathers, the apostles, and especially Christ Himself. It would also deny the ability of God to preserve His Word intact, for every generation to come until Christ returns. God, who is the creator of the heavens and the Earth (GE 1:1), who by His powerful Word holds all things together (Heb. 1:3), is capable, and has provided us His Word, just as He wants us to receive it. Just as we need water to drink, and food to eat, we must also have the Word of God. Jesus said, "It is written: `Man does not live on bread alone, but on every word that comes from the mouth of God. " MT 4:4. It is the responsibility of every believer to know what God says. The only way anyone can be sure of what they are being taught, whether by a priest, preacher, teacher, prophet or evangelist, is to read, and study the Scriptures for himself so that he will know the truth, which sets him free (John 8:32). Otherwise, he will be at the mercy of everyone who claims to speak for God. There are many examples of where Jesus quoted the Scriptures. When He was being tempted by the devil, His response to him was, “...It is written.” (MT 4:4, 7, 10) Jesus was quoting Scriptures from the book of Deuteronomy 8:3, 6:13, and Psalms 91:11-12. He often confirmed the Scriptures by quoting them. (See also Matthew 11:10, 21:13, 26:24, 31, Mark 1:2, 7:6, 9:13, 14:21, 27, Luke 4:4, 8, 10, 17, 7:27, 19:46, 22:37, John 6:45) If the Scriptures had no authority, why would Christ who was given all authority in heaven and on earth (MT 28:18) use these then? He used them because He knew that the Scriptures were reliable and correct in their teaching about God and their instructions about how to live righteously. The Bible has the power of God to save everyone who believes. What the apostle Paul had fully proclaimed, is capable of saving everyone who believes. There is nothing more that can be added that would benefit anyone. I have often heard people say that the Bible contradicts itself. The fact is that there are no contradictions in the Bible. Every supposed contradiction comes from priests, preachers, teachers, prophets, and evangelists who by their own teaching contradict the Bible. Those who do it, will claim that what they are teaching is from the Bible, when in fact, either they have twisted and turned the Scriptures to falsely fit what they are trying to pass off as doctrine, or they cannot come up with a legitimate reference in the Bible which will back up their claims. That is why so many people are confused and think that the Bible is unreliable. These supposed contradictions are actually people contradicting the Bible, rather than the Bible contradicting itself. The Bible is completely reliable, and must be read and studied as often as possible, by everyone who claims to be a Christian. It is the standard by which we should live. I have also heard that the Bible is unreliable because men wrote it. Are priests not mere men? What about popes, bishops, and preachers, are they not also mere men? Do we listen to men like Billy Graham, Oral Roberts, Jim Jones, or David Koresh? Do you know that David Koresh still has followers? Which of these men really speak for God? How do you know how to tell the difference? The truth is that even though men wrote the Bible, their inspiration came directly from the Holy Spirit. These men were not infallible, but their collection of writings which were designated as part of the official canon of the Church, were. Today, priests, bishops, popes, and preachers like Billy Graham and Oral Roberts, if they have been called by God, not only have the authority, but they also have the responsibility to teach what is written in the Scriptures. If they teach anything else, they are guilty of adding to, or taking away from God’s Word. They have no authority to do it and they will be judged if they do. But we must be willing to question people who do such things, and if they do not repent, they must not be allowed to continue deceiving those who are sincerely seeking God. We should not submit ourselves to such men. It is important to check what you are being taught just as the Bereans did when the apostle Paul preached to them. Was Paul offended when he learned that the Bereans were later reviewing the Scriptures to verify if what he was telling them was true? After all, he was chosen by Christ to be an apostle (Acts 9:15). No, he was not offended, instead he commended them for it. When it comes to issues of salvation and good Christian living, the Bible is clear. There are no gray areas where the commands of God are concerned. Christ never beat around the bush when addressing sin. He called it what it was. The apostles’ instructions for Christian living are also cut and dry. There is no need to try to interpret what they were saying, or look for some esoteric meaning. Their instructions to us are clear and simple to understand by anyone who is capable of reading, or hearing them. The parables can also be easily understood because they are always explained. If there is anything in the Bible that is not easily understood, it is the prophecies. Prophecies are not normally understood until after they have been fulfilled. Is it important to understand prophecies? We should not ignore them, and we may never be able to understand them ourselves, but God has given certain men the ability to reveal the truth about them, and it is our responsibility to seek them out, and listen to them. One of the gifts of the Holy Spirit is the gift of prophecy. Some people in the Church might be given the ability to prophesy. Do I mean they have the ability to see future events? Not at all. 1 Cor. 14:39, what does he mean? Does he expect us to all be predictors of the future? Of course not! He explains the purpose of prophecy in 1 Cor. 14:31. “For you can all prophesy in turn so that everyone may be instructed and encouraged.” Instructed and encouraged as to what? Instructed as to how to live a Christian life, and encouraged as to the salvation that God has given us through Christ our Lord and Savior. These instructions and these encouragements are all found in the Bible, the Word of God. Every other kind of instruction and encouragement that does not point to Christ is selfish and self-serving. It is not from God. Those who prophesy to others about their future, give false instruction and encouragement, especially in light of Ecclesiastes 7:14. Those who practice such things are no different than palm readers, tarot readers, fortunetellers, and astrologers. They are false prophets and will receive the rewards reserved for such. (see the article Apostles and Prophets Today for more information about modern dat prophets. The Bible must be read and studied completely so that you can know the One True God. The Old Testament should not be ignored because it shows us the proof that Christ is the One that the prophets testified about. It also shows us how God deals with His people, and He does not change (Mal 3:6). But the New Testament should be used as a guide for all Christians, because it is there that Christ reveals Himself as the mediator of a new covenant, which we who believe, are now a part of (Heb 9:15). The New Testament explains clearly how to be born again, and how to live, as Christians should. It has complete authority, and is more reliable than any man who ever lived, except Jesus Christ. This is how the New Testament should be considered on all spiritual matters, and for correct Christian living. If Christians everywhere would regard the Bible in this way, we would not be divided into denominations the way we are. We would be united, as Christ wants us to be. But there are those who teach doctrine that is not sound, and contrary to what God would want us to know. We must learn to avoid such imposters, false teachers and false prophets. The gospel, which was entrusted to the apostle Paul, contains sound doctrine. We would do well to know what he says. Some preachers ought to go back to the instructions the apostle Paul gave to Timothy, otherwise men will be confused and will turn away from the truth, and those preachers will be guilty of misleading them. The authority of God’s Word reveals to us who has authority, and who doesn’t. No one has authority to add to or take away from God’s Word. No one has authority to change His Word in any way. God has given men authority to reveal His Word in truth and completeness. Anything else is unauthorized, and everyone who is guilty of doing what God has not authorized, should be avoided. Remember, the one who preaches false doctrine not only condemns himself, but also those who follow him. The Authority that God has given to man. What authority has God given to us, not only as a church, but in general? First, in all circumstances, we must obey God, rather than men (Acts 5:29). That is why it is so important to know the Scriptures so that we will know whether we are obeying commands of God rather than the commands of men. We must be able to recognize when God didn’t really say something. He commands us to have children, to fill the earth and subdue it. We not only have the right to have children, but we have a responsibility to have children. Some countries, like China, forbid couples from having more than one child, often forcing women to have abortions. We were given authority by God to have children, yet some governments, even our own, advocate, and even sponsor programs that circumvent God’s very first command to us. We were given the command to subdue the earth. That means that He has given us the authority to take over the land, to make it work for us. We have the authority from God to plant and harvest fields, to mine quarries, and use the resources, as we deem necessary. He gave the earth to us to use as we have need. He also commanded us to rule over the fish, the birds, and every living creature, giving us authority over them to use for our own purposes. Initially, God gave us plants and trees with fruit to use as food, but later He also gave us the animals to eat as well (GE 9:3). We have been given authority by God to eat anything He has planted, and every animal that He has created. With authority comes responsibility. If we have children, we have a responsibility to take care of them, and to teach them, and to raise them properly. With the earth and the animals we have a responsibility to make sure that we don’t plunder and waste the resources that God has provided, but to use them appropriately so that the supply can be replenished. With authority comes responsibility. God has also established local governments to rule over the people. Those He has authorized to rule, have His authority to carry out judgments based on the laws of the land. The governing authorities also have responsibilities not only to God, but also to the people that they rule over. They must be fair, just and not oppressive. We are under the authority of the government and must submit willingly to all of its laws. We might not like the present ruler, or even agree with his position on certain things, but God is the one who has given him authority. Civil disobedience or willfully failing to pay taxes may sound like appropriate responses toward a leadership that might be doing wrong, but it is actually rebellion against God. Instead, we are told to pray for that leadership. Now there are certain Christian leaders who assume authority that God has not given them. We must all be careful to obey all who have authority over us, but we have no responsibility to obey anyone who assumes authority that they do not really have. A good example of what I am talking about is the fact that there are religious leaders in many Churches who hold that all Christians should submit to their authority. 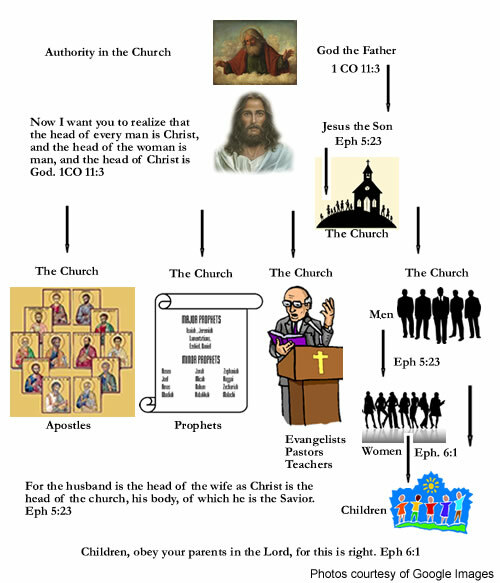 The leaders of the Roman Catholic Church, the leaders of the Eastern Orthodox Churches, and the leaders of many Protestant denominations all claim to have authority over the entire Church. How can this be? Can any of them be right? Is there one who has authority over the entire church? The answer to that question is simple. Yes, there is one who has complete authority over the Church. That One is Christ. Only He has authority over the Church as whole. (1 Cor 12:12-27, Eph 5:23, Col 1:18-24). (GAL 3:28), but men have authority over women. You can clearly see in these Scriptures, and in this illustration, that the head of Christ is God the Father, the head of every man is Christ, who is also the head of the Church, the head of the wife is the husband, and the head of the children are the husband and wife. It is very important to realize that if any man claims to be the head of any other man, or the head of any other mans’ wife or daughters, he does not understand the truth about who is the head of the Church, and he should be corrected, and avoided. Each head has certain authority. We know that God the Father has authority over everyone and everything. We also know that God the Father gave Christ all authority in heaven and on earth (MT 28:18). We know that Christ gave authority to His twelve disciples to drive out spirits, heal the sick, and to trample on snakes and scorpions (MT 10:1, MK 3:15, 6:7, Luke 9:1, 10:19). He also gave them authority to build up those who were subjected to their authority, rather than tear them down (2 Cor 10:8, 13:10). He gave them authority to give instructions to all believers (1 TH 4:2). Christ gave the apostles authority to bind and to loose, that is whatever they would bind on earth, would also be bound in heaven. Whatever they would loose on earth, would also be loosed in heaven (MT 18:18). I take this to mean whatever they allow, God will also allow, and whatever they do not allow, God will also not allow. But they would never contradict Him. Along with the authority Christ gave them, they were also given responsibility. They were to use their authority appropriately, and not lord it over anyone (MT 20:25-28, MK 10:42-45, Luke 22:25-26). And they were to teach, instruct, and encourage according to sound doctrine (Titus 1:9, 2:1). Christ gave them much authority, but also much responsibility. If we are to obey the first commandment, to Love God with all our heart soul and mind, we must be authorized to do so. How do we love God with all our heart and soul? The answer to that is found in Deuteronomy 13:1-4. Here we see that God is testing us to see whether or not we love Him. If we are not willing to follow the One True God and revere Him, then how can we say that we love Him? There are men today who claim that they are prophets of God. They profess miracles that are nothing but illusions, and distortions of the truth, or outright lies. They claim to love God, and they teach attributes and characteristics which are not really His. Then they say, follow this god. It is a subtle deception, and if a sincere believer is not careful, and is not diligent to read and study the Scriptures which have all authority on matters of faith, then they will be deceived and they will follow a false god. Can they really say that they love Him with all of their heart and soul if they are not willing to use the authority that God has given them to read and study the Scriptures so that they are not misled? In that same commandment, we are to love God with all of our mind. How is this possible? First, we should have in our minds, the things of God (MT 16:23, MK 8:33). That is, we should think in terms of what is of eternal significance. Then we should all be united in our minds. That is, our goal as a Church should be one and the same; to lead others to Christ, to teach others to love God with all our hearts, souls, minds, and strength, and to teach them to love our neighbors as we love ourselves (1 CO 1:10, COL 2:2). We should be willing to let our minds be controlled by the Holy Spirit (RO 8:6). We should be willing to renew our minds by no longer conforming to the pattern of this world (RO 12:2). We should learn to have the mind of Christ (1 Cor 2:16). This can be accomplished by reading and studying His Word. We should also learn to think on things that are true, noble, right, pure, lovely, admirable, excellent, and praiseworthy (PHP 4:8). These are the ways we prove that we love God with all of our heart, soul, and mind. We are authorized by God to love Him this way, and unless you know who the One True God is, your love and devotion will have been in vain. Not only are you authorized to read and study God’s Word for yourself, but you are also authorized to question doctrine that is not sound, and sharply rebuke those who contradict the true teachings of the Scriptures (Titus 1:10-16). (2 COR 3:6). We are authorized to carry out our individual ministries, whatever they may be. But with authority there is also responsibility. There is a proper way to help and to minister. The Bible explains perfectly how we are to do those things. Now there are some religious leaders who would take issue with me on these things. Some leaders say that we are to obey them completely, and without question. They use Scriptures like Hebrews 13:7. This Scripture is not talking just about Spiritual leaders, but all that are in a position of authority over you. Here is an example of the type of spiritual leader one should submit to. I have also heard certain religious leaders discourage people from questioning their authority, or teachings. They use Scriptures like, "Do not rebuke an older man harshly, but exhort him as if he were your father... "1 TI 5:1 or "Do not touch my anointed ones; do my prophets no harm." PS 105:15. They forget that the apostle Paul commended the Bereans as having noble character for not believing every word he spoke until they checked what he was saying against the Scriptures (Acts 17:11). There are three problems with using these Scriptures to try and keep believers from questioning those leaders. First, 1 Timothy 5:1 is not speaking about church leaders, but actual older men. Second, if the religious leader in question was a true prophet of God, he would have nothing to fear by those who question him, and he would encourage them to do it as often as they heard any man of God speak. Third, if we are not allowed to question religious leaders, then we would have no choice but to believe every preacher and every doctrine, no matter how contradictory they were. There would be no way to distinguish a true prophet from a false one. We would be at the mercy of everyone who claims to speak for God. Every True believer is authorized to test, and to question, and to weigh carefully everything that is said. And like the Bereans, we must use the Scriptures as our only standard. There are those who are unwilling to accept that their authority is limited. God gave each one of us authority to do certain things, based on the gifts He has bestowed upon us (1 CO 12:1- 14:18). That authority is limited by the ability God has given us. This is where responsibility comes in. We should be able to recognize our own limitations. For example, if we are not well versed in the scriptures, we should not try to teach them. If God has not authorized us to do something, we should not be doing it. I have heard certain Church leaders say, that he is our head. Another term that is used is covering. This is not a Biblical teaching because our head is Christ. Whether priest, pastor, preacher, teacher, prophet, evangelist, or common man, Christ is the head of all His Church, not the pope, bishop, pastor, preacher or anyone else. And finally, I must finish this with something that cannot be avoided, and that is, the role of women in the Church. What authority do women have in the Church? We can see from the Scriptures that some women held positions of authority. Miriam, who was Aaron’s sister was called a prophetess because she spoke what Moses told her and Aaron to speak. Moses received revelations from God and gave them to Aaron and Miriam because of his speech impediment. But because Miriam spoke something that God had not said, He punished her, first by giving her leprosy, then because of Aaron’s appeal to Moses, and Moses’ appeal to God, she was confined outside the camp for seven days (NU 12:1-15). There was also a woman whom the apostle Paul wrote to and recognized as an elder (2 JN 1:1). Unfortunately, these cannot be used as justification for women preaching, prophesying, teaching, or leading the Church. The apostle Paul makes it clear that woman should have no position of authority over a man, and she must remain silent. That means she has no authority to teach, preach, prophesy, evangelize, or even pastor. A woman should learn in quietness and full submission. I do not permit a woman to teach or to have authority over a man; she must be silent. For Adam was formed first, then Eve. And Adam was not the one deceived; it was the woman who was deceived and became a sinner. The Bible couldn’t be more clear on that point. None of these things were written to offend anyone, but so that everyone will know and understand that they have a proper role in the Church. Someone might be tempted to quote Galatians 3:26-29 as justification for allowing women to hold positions of authority in the Church. But we must consider two things before we draw any conclusions: First, these Scriptures are talking about our relationship to Christ, and our inheritance. In that context, we are all equal. We all have the same hope for salvation. But the apostle Paul who wrote, “ I do not permit a woman to teach or to have authority over a man; she must be silent.” , also wrote, “...There is neither Jew nor Greek, slave nor free, male nor female, for you are all one in Christ Jesus.” In one verse he says that women must be silent, and in another he says that we are all equal. Someone might say that since we are all equal, it makes no difference that the speaker is a woman. Can we ignore 1 Timothy 2:12 because of Galatians 3:28, or does Galatians 3:28 have another meaning? If all Scripture is God breathed as the Bible says (2 TI 3:16), the apostle Paul could by no means contradict himself. He must have had something else in mind when he wrote Galatians 3:28. What he had in mind was that we all have the same hope, not that we all have the same authority. God has given men authority over women, not the other way around. Men have a responsibility to assert their authority, but appropriately. It would be a sin for a man to relinquish his God given authority over his wife and his children. It is a huge responsibility, which God expects all men to fulfill. God has given the father authority to forbid a vow that was made by his daughter, and He will honor the father and release his daughter from it. Again, God has given the husband authority to forbid vows and promises that he hears his wife make, and God will honor him and release her from it. There is no one to forbid such vows, and God will hold those who are divorced or widowed responsible to fulfill them. Only He has authority over them. Here we see that the husband has the authority to confirm or nullify a vow made by his wife, after he hears about it. God will honor whichever position the husband takes. But if he says nothing about the vow, even though he might disagree with it, he still confirms it by his silence. If he later nullifies the vow, he will be held responsible for the wife’s failure to fulfill it. God places the responsibility squarely on the husbands’ shoulders, even though he may have had nothing at all to do with the vow except that he heard about it. In God’s eyes, the husband is responsible for the actions of his wife, and he will bear her guilt if he says nothing to her about those actions. He has authority to approve or disapprove of the things, which she does, and she has the responsibility to submit to him, or she will bear her own guilt. What God authorizes us to do as individuals, is between Him and us. We must be willing to seek His guidance when we wish to exercise that authority. We can know the limits of the authority He has given us, by reading, hearing, and studying His Word. We have to be sure that when we listen to His Word, it is coming from someone who is authorized to preach or teach it, and we must also be willing to weigh carefully all that is said (1 COR 14:29). If we exercise the authority that God has given us, we must not lord it over those who are under that authority. We must be responsible in the way we administer our authority, and humbly realize that we did nothing to gain our position, but God is the one who gives everything, even when we deserve nothing. Permission is granted to copy and distribute this article in its entirety, provided that it is not sold or used in any publication that is sold. Also, this disclaimer must accompany the article along with the author’s copyright and Zondervan’s copyright. All other uses for this article must be approved by the author in writing.